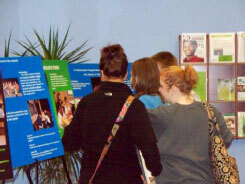 On Wednesday, December 8, 2010 the Office of Title III Learning Communities will host its Annual Poster Day. Students from each of the Fall 2010 CSU Learning Communities will exhibit posters and other project activities, describing the exciting academic experiences they have had this semester.The event will be held in the CSU Michael Schwartz Library in Rhodes Tower, 1860 East 22nd Street from 11 AM until 1 PM. Poster Day begins at 11 AM and continues until 1 PM. During this period, you are invited to move through the poster displays, stopping to interact with those who have prepared a poster or to learn more about topics of special interest to them. 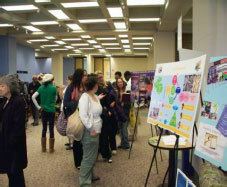 Poster presentations provide students the opportunity to showcase and exhibit some of the exciting projects, service learning experiences and field trips involved in Learning Communities experience. Faculty, staff, students and the public are welcome and encouraged to visit the event. Experience the involvement and interaction among learning community students and the excitement of engaging with prospective students from high schools who will also attend. Learning Communities create the sense of a small campus by helping students get connected, grow intellectually and socially, achieve better grades and enhance their likelihood of success. In Learning Communities, students are exposed to a variety of disciplines and programs of study that allow them to make connections from multiple perspectives. This usually leads to more fully engaged learning, better understanding, and higher grades. Permanent link to this topic. Posted 2010-11-29 15:28:05. Reply to Lauren_Felder. Categories: Library News. Monday-Wednesday 7:30 a.m. to 10 p.m. Permanent link to this topic. Posted 2010-11-22 12:19:10. Reply to tracy_kemp. Categories: Library News. (From left) Glenda Thornton, Bill Barrow & Jill Tatem. 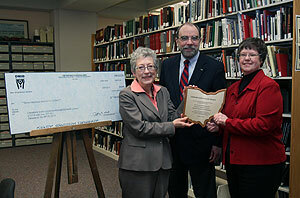 Special Collections at the Michael Schwartz Library, Cleveland State University has been awarded the 2010 Achievement Award from the Ohio Historical Records Advisory Board. The award is presented annually by OHRAB in recognition of significant accomplishments in preserving and improving access to historical records in any format by an Ohio archival institution. Cleveland State's Special Collections Department has led the Cleveland Memory Project since its beginning in 2002. 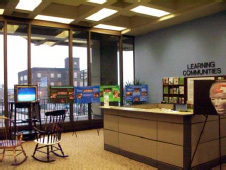 Institutions as diverse as the Cuyahoga County Engineer's Office, Berea Children's Home, Rocky River Public Library, Hathaway Brown School, and Lakewood Historical Society have contributed materials from their collections to Cleveland Memory. Project partners have made more than 42,000 images and other historic items available online. Practicum and internship opportunities provide real world experience to students while bringing fresh from the classroom perspectives to practitioners. Cleveland Memory is a model of multi-institutional collaboration melding local collection knowledge, shared infrastructure, and professional development opportunities. OHRAB congratulates Cleveland State University and its partners for expanding access to Ohio's historic resources. Bill Barrow, the Special Collections Librarian at the Michael Schwartz Library, commented on the award with the following, "We all greatly appreciate this important recognition from the Ohio Historic Records Advisory Board, in awarding us one of their two awards in kicking off their new achievement awards programs." 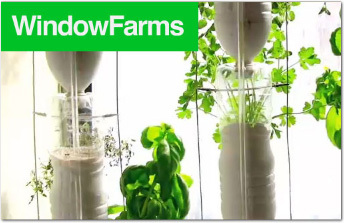 Noting the many collaborations involved in the project, Bill Barrow goes on to say, "However formally awarded, this is an honor we all share. The nomination stressed the multi-level community collaboration of CSU departments, KSU library practicum students, various partnering public libraries, historical societies and government agencies sharing resources and the partners in the Ohio's Heritage NE [Northeast], all collaborating to make information on the region's history available to its citizens. We felt the process by which Cleveland Memory (and OHNE) were built is as important as the digital content it provides." The Achievement Award was recently presented to Bill Barrow, the Special Collections Librarian at Michael Schwartz Library and Glenda Thornton, Director of the Michael Schwartz Library by Jill Tatem, University Archivist, Case Western Reserve University. The award consisted of a plaque and a $700 check. The plaque is inscribed in part with the message, "For its work making resources of Ohio History available to a broader public in the Cleveland Memory project," while the check will go toward a project involving the digitization of Cleveland's first five directories. According to Bill Barrow, "the output of this overall project would be a geo-referenced database of 15,500 names, occupations, etc., gleaned from those directories and available for research into the first half-century of Cleveland history." Read more about the award. Permanent link to this topic. Posted 2010-11-15 10:04:47. Reply to Lauren_Felder. Categories: Cleveland Memory, Library News. Permanent link to this topic. Posted 2010-11-08 17:24:48. Reply to Tracy_Kemp. Categories: Library News. Showing posts from November 2010 only. Display other dates.